Drones For Firefighting // How can they be used by firefighters? Could these drones become the future of firefighting? Today we have a rather unusual topic for discussion. I’m sure most of you are well familiar with the fact that drones are becoming a solid workforce across a plethora of industries. But, do you guys know that drones could become the future of firefighting too? It’s true! With wildfires being a threat every summer, it’s no wonder firefighters are turning to technology to minimize their exposure. However, are drones for firefighting advanced enough to be of great help to firefighters? How can drones help firefighters? As far as helping the firefighters is concerned, drones could actually make great partners. Not only do drone missions mean less exposure to danger from firefighters but they also allow solid reports from up hight, providing with a much clearer picture of the inflamed area. So, undoubtedly, drones can definitely help firefighters. But, drones can sometimes do more harm than good… at least in terms of firefighting, that is. How? Check this out! Why are drones frustrating firefighters? Well, the matter is quite simple actually. During the last wildfire season in the USA, there were several cases of firefighting planes being grounded because of hobbyists flying their drone near wildfires. Of course, such action is justified since a collision between the two could lead to catastrophic outcome. In the course of this year (by July 7th, to be more precise), there were a total of 17 drone incursions over wildfires, preventing flights of firefighting airplanes and helicopters. The trend continues to rise so I kindly ask you not to fly your drones near a wildfire. No matter how spectacular footage you might get, think of the catastrophic results you could produce because of your negligence. 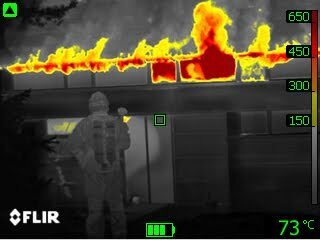 Are thermal cameras necessary for a good firefighting drone? Well, quite frankly, I’d say that they are. Even though drones can provide a fair share of useful info without thermal cameras, their addition would greatly improve vision through smoke and allow drones much quicker navigation and threat-detection. However, not many commercially available drones support thermal cameras. In fact, there are just 2, more or less mainstream models that directly or indirectly support thermal cameras. Both of them are listed (and explained) down in the list below. Of course, I am talking about DJI Inspire 1 with its XT gimbal and Flir Vue Camera and Yuneec Typhoon H with its own dedicated Yuneec thermal camera. Could drones be the future of firefighting? Could drones prove much more helpful than they are now? At the moment, drones are only used to gather information about the wildfire. And take that with a grain of salt since only a handful of countries are effectively using them. However, in the foreseeable future, it could lead to drones taking up much bigger parts of the job at hand. Today, we already have drones in agriculture that can carry a lot of payloads and effectively sprinkle it where needed. With a few adjustments, these drones could be turned into small, cheap to operate, firefighting UAVs capable of extinguishing fires. Of course, it would require a swarm of them to shut one down, but a few would be a good starting point nonetheless. Before jumping to the list, I just want to make sure you understand that these drones are in no way whatsoever specifically built for firefighting missions. Instead, I am just trying to show you there are good commercial drones that can be modded (preferably with thermal cameras) in order to accomplish basic firefighting tasks. So, with that said, let’s check these birdies out! 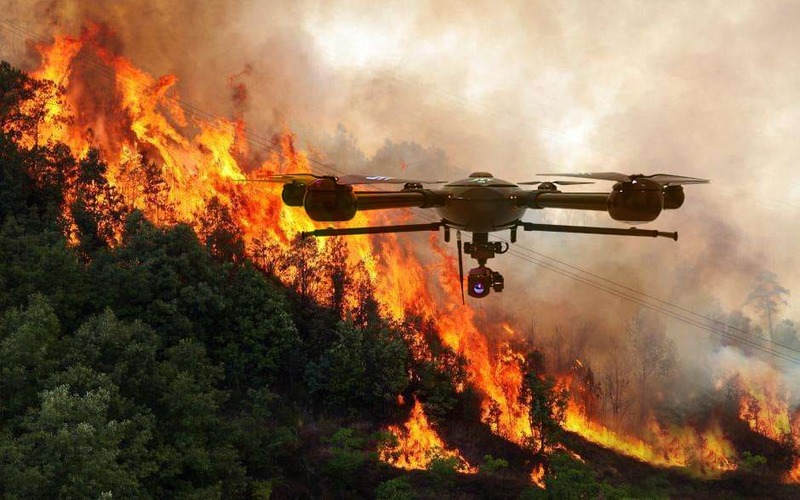 The first of the two drones capable of doing firefighting tasks is Yuneec Typhoon H. This hexacopter brings serious firepower to the equation and isn’t afraid of showing it. Made by Yuneec, this drone has captivated a fair share of audience and seems to be on par with DJI’s newest models. But, is it really as good as the original DJI inspire, at least in terms of firefighting capability? Well, why don’t we find out?! Thermal imaging solution is also made by Yuneec. We are talking about their YUNCGOETUS thermal camera that does its job fairly well. However, it is nowhere near the likes of Flir Vue Pro 640 R. That’s a completely different level of thermal imagery which alone costs more than Yuneec Typhoon H together with its YUNCGOETUS camera. As far as features go, safety is a primary concern so it’s not a coincidence we’re seeing Intel RealSense obstacle avoidance system. Finely poised with several other safety and autonomous flight features, Yuneec Typhoon H looks to be well-prepared for any sort of tasks you put it up against. When it comes to specifications, Yuneec Typhoon H Is definitely on point with Inspire 1. It even has a slightly better airtime (25 minutes in comparison to 18 on Inspire 1) due to its 4S 5400mAh LiPo battery. Unfortunately, it only has half the range of DJI Inspire 1 which is a huge minus in my eyes. However, I still consider Yuneec Typhoon H to be a great drone and a solid choice for budget-firefighting. Even more so considering it costs less than the original Inspire. 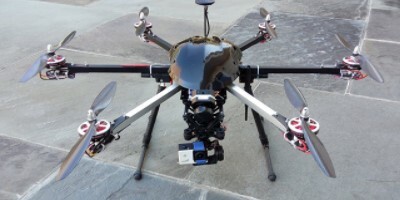 Whether you are looking for drones that can collect wildfire data or help firefighters with its aerial vision… or even help put the fire out… FreeFly Alta 8 makes it an easy task. This bestial drone does not take no for an answer and it strictly shows just that with its aggressive (and extremely bulky) appearance. 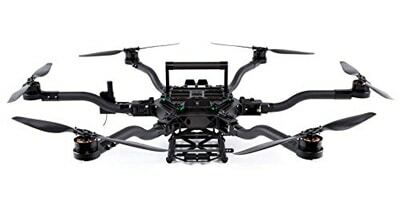 This marvelous octocopter is equipped with serious firepower but sports the price tag to go alongside it. However, since firefighting is a tricky line of work, I firmly believe FreeFly Alta 8 to be worth every penny if it can help save human lives! Starting off with the numbers, you should know that this thing can take 2 6S LiPo batteries in a parallel manner at the cost of a slightly lower maximum payload weight. Still, don’t let that discourage you as FreeFly Alta 8 can carry a total of 20 pounds due to the insanely powerful hardware found inside. Furthermore, you should also know that this thing works with plenty of transmitters including the ever so popular Futaba and Spektrum models. Surprisingly though, it is fairly easy to control too, which seems unbelievable considering the sheer size of this thing. As far as expansions go, this birdie supports several mounting brackets for FPV cameras, thermal cameras, and standard HD CMOS ones. There’s also plenty of room for a sophisticated aerial photography system (I am, of course, referring to motorized gimbals and DSLR cameras). Plus, there is no need to worry about landing gear since it’s inverted, allowing plenty of space for you to record videos and collect various data. Even though DJI Inspire 2 is now a well-established drone, it is quite surprising to see no backwards compatibility with the outstanding Zenmuse XT gimbal that supports thermal cameras. More precisely, we are talking about professional grade Flir Vue thermal cameras that are equipped on specialized firefighting drones like the one by FlyByCopters that’s explained below. However, there is a way to make these cameras work with the newer DJI Inspire 2. And you have every right of wanting to do that since there are quite a few upgrades over the original Inspire. This setup is based around Tarot 3-axis gimbal for Flir Vue cameras. However, it requires a bit of modding so it is not recommended for beginners. 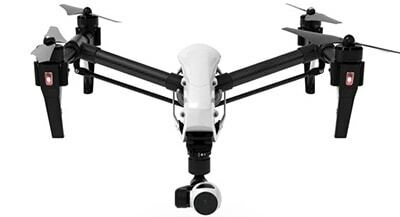 As far as the performance of DJI Inspire 1 is concerned, you won’t be too disappointed. After all, it was one of DJI’s top models a few years back, and needless to say, it has aged well. So, in terms of specifications, you are looking at roughly 18 minutes of flight time. Keep in mind that time will be less if you tend on using the thermal capabilities of Flir Vue during the entire flight time. Range, however, has no such limitation and is standing exceptionally long at 3000 meters. If you take the grand scheme of things into consideration (and by grand scheme I mean comparing Inspire 1 with Inspire 2), you will come to conclusion that Inspire 2 has much better specifications. And it’s true, 5000 to 7000 meters and roughly 25 to 27 minutes of flight time are clearly superior. But, since it requires a technically demanding setup to work properly with thermal cameras, I cannot recommend it to beginners. Moving forward to the features, DJI Inspire 1 has a whole bunch of them at its disposal. The ones you will be using the most (if you plan on using this baby as a firefighting drone) are definitely circle around and waypoints. Luckily, work flawlessly so you’ll be up for an easy experience with this one. After checking out these 2 commercial drones, it’s time to take a look at a professional grade drone that could prove to be a valuable asset to every firefighting department. Keep in mind though, this birdie is equipped with technological wonders so it’s no surprising to see it cost over 20 grands! This aggressive looking octocopter (yes, it has only 4 arms but 8 motors since there are 2 of them on each arm) is powered by amazing hardware and, quite frankly, costs a fortune. However, this is not surprising at all since it is not targeted to civilians. Instead, this beauty of a drone is targeted at firefighting departments who wish to modernize their equipment. First thing that needs to be said about this one is the fact that it sports 2 cameras. 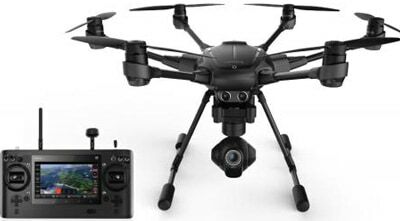 Besides Sony A6000, FlyByCOpters Thermal Surveying X8 also sports Flir Vue Pro 640 R. The R at the end of its name means that it has the ability to capture radiometric data, allowing for pixel-accurate temperature reading of the area in its focus. Needless to say, this provides firefighters with a lot of materials to work with. Moving forward, it’s also notable that this birdie has automatic geotagging with Flir thermal camera. On the other hand, Sony A6000 allows seamless area surveying and mapping with pinpoint accuracy. These tasks greatly benefit from highly precise multi-GNSS RTK GPS units (accuracy cca 2 cm) as well as an autopilot system with a total of 6 flight modes. Furthermore, FlyByCopters Thermal Surveying X8 drone comes with a 5.8G live FPV feed through the included 7-inch display on the controller. Telemetry is present as well, and so is the fully configured Pixhawk AutoPilot Flight controller. With a flight time of 25 minutes, it’s not the greatest flyer out there… but the things this drone can do within those 25 minutes are just incredible… and if you ask me – definitely worth the price tag for every firefighting department in the world! As you could see, FlyByCopters’ professional firefighting drone is miles ahead of current mainstream models. But, in their defense, the price tag is miles away too, so it’s not exactly a fair fight between the two. So, with everything that’s been said, I believe we can come to a conclusion that drones could greatly affect the future of firefighting. Considering the fact they’re already establishing themselves across so many industries, it would be a surprise to see their firefighting potential going to waste. What are the main differences between 2 axis and 3 axis gimbals ? 7 reasons to buy the all-new MJX Bugs 2W !